Gerald Lee Andersen was born on June 20, 1923 to Ernest William (1899 – 1982) and Verna Esther Yost (1900 – 1950) Andersen. Ernest was born in Nebraska and his parents were born in Denmark. Verna was born in Virginia, as were her parents. Ernest and Verna married on November 19, 1920. In 1930, the Andersen family (listed in the 1930 census under the spelling “Anderson”), lived at 28 Adrian Street in Seneca, Thomas County, Nebraska. Ernest was the manager of an oil station. The Andersen’s had six children: daughter Betty J (8), son Gerald (listed as Girald J) (6), daughter Lila M (4), son Dale E (3), son Billie L ( a month shy of 2), and son Don D (10 months). James R Andersen (28) was listed as a boarder. James was Ernest’s brother and his occupation was listed as truck driver for an oil station. Gerald Lee Andersen married Esther Elaine Coolen, date unknown, before he began his military service. Esther was born June 16, 1916 in Pawnee, Pawnee County, Nebraska. In 1940, Esther was 23 years old, lived in the same town as the Andersen family (Seneca, Thomas County, Nebraska), and was employed as a school teacher. After they married, Gerald and Esther lived in Stromsburg, Polk County, Nebraska, where Esther waited for Gerald to return from war. 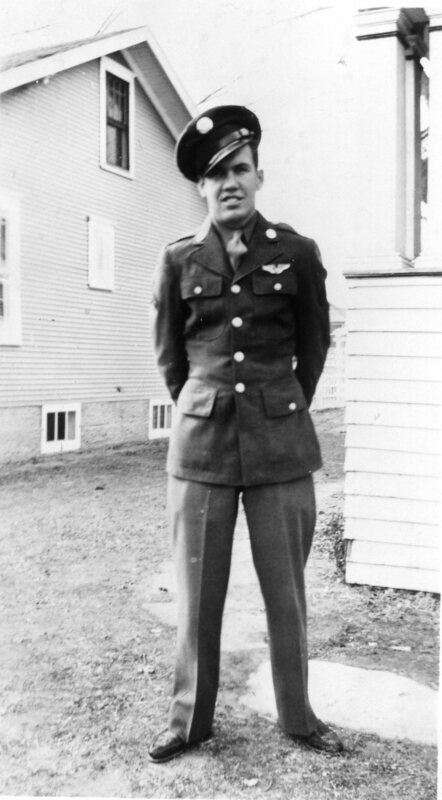 Gerald served as a tail gunner with the 8th Air Force, 384th Bomb Group, 544th Bomb Squad, Joe R. Carnes crew. He was assigned to the 384th on AAF Station 106 Special Orders #148 dated July 26, 1944. He flew twelve missions and was only 21 years old when he lost his life on September 28, 1944 in the mid-air collision between Lead Banana and Lazy Daisy. He is buried in Fort McPherson National Cemetery in Maxwell (Lincoln County), Nebraska in Section F, Site 1229. Esther was heartbroken by the news of the death of her husband. Letters she wrote to my grandmother, Raleigh May George Farrar, can be read here. Esther did not remarry until 1953. She died on March 6, 2002 in Lincoln, Lancaster County, Nebraska. By thearrowheadclub in Andersen, Gerald Lee on June 3, 2015 . I am Gerald Lee Andersen U.S. Army co youngest sister Kay (Andersen) Wolfenden and would welcome any more information on Gerald that anyone might have. Thank you, Kay Wolfenden. Thank you for contacting me, Kay. I have e-mailed you with all the information I have on Gerald. If you have any information or pictures you’d like to share of Gerald, please let me know.